These grain-free and gluten-free mini caramel pecan tarts couldn’t be any easier and are the perfect end to Thanksgiving dinner! 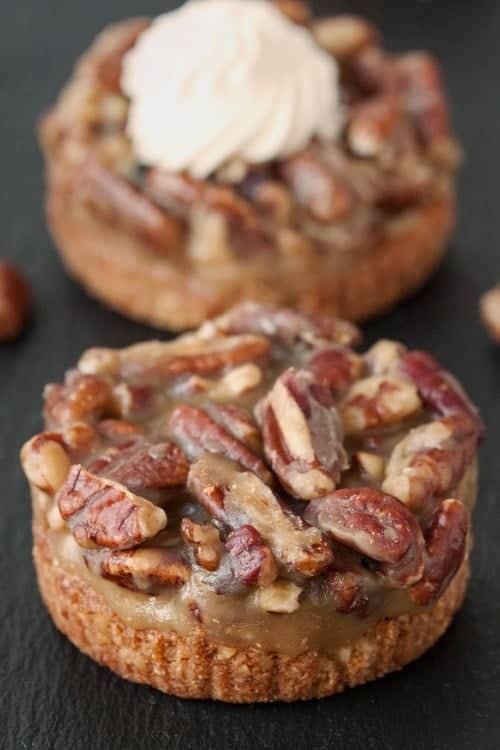 In my last two gluten-free recipes, I used oats and oat flour but for these mini caramel pecan tarts, I wanted to incorporate some nuts and nut flour for an ultra-nutty treat. The result is a crust that’s very similar to a graham cracker crust, though a little softer. While you certainly can use pecans in the crust, I opted for walnuts as they’re much cheaper where I live. The primary taste in the crust is cinnamon so I don’t feel like I missed out on anything by not using pecans. The only downside to this crust is that it’s not suitable for fillings that require baking. Even with chilling, pre-baking and an egg white wash, the baked fillings I tried leaked through. Grain-free crusts can be finicky like that, which is why I came up with this easy no-bake caramel filling. I have to admit, I’m quite possibly the world’s worst caramel maker. I attempted and failed at 7 different caramel recipes before I found this one that’s incredibly easy. There’s no caramelizing of sugar, which I think is key for those of us with caramel issues. You simply mix everything together and let it simmer for 8 minutes. 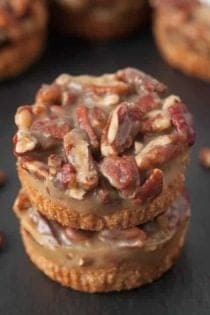 I’ve made it a few times now, with each time a success, so I’m confident that anyone can make these cute little mini caramel pecan tarts! I originally made these in six 4.25″ mini tart pans and then realized that people probably don’t want to eat such a huge serving of caramel and nuts after a heavy Thanksgiving dinner. The tarts looked amazing but weren’t practical unless you cut each tart into 4 pieces, which kind of defeats the purpose of mini tarts, doesn’t it? If you don’t want to bother with making them as tiny tarts in a muffin pan, I’m pretty sure a 9″ tart pan would work. Just bake the crust until nicely browned and follow the rest of the recipe! Should you not have almond flour on hand, you can use another type of finely ground nut flour. I tried using a total of 2 1/4 cups of walnuts instead of using a mix of almond flour and walnuts, but the texture was much better with the latter. If this gluten-free crust isn’t your speed, you can use whatever tart crust you’d like or make them into bars using the crust recipe in Jamie’s chocolate caramel shortbread bars. Not feeding a crowd? You can easily halve this recipe for only 9 mini tarts. And if it’s just the two of you, try my gluten-free apple crumbles for two. 1. Preheat the oven to 375°F. Line two muffin pans with 18 muffin liners. 2. Prepare the crust. Place all the crust ingredients in the bowl of a food processor fitted with the S-blade and pulse for 15 seconds or until there are no large chunks of nuts left. The nuts should be 1/8" or smaller in size. Press 20 grams, about a rounded tablespoon, of dough onto the bottom of the each liner. Try to press it in the nooks and crannies of the muffin liner. 3. Bake for 7 minutes or until golden brown. Let cool for at least 20 minutes while preparing the rest of the recipe. 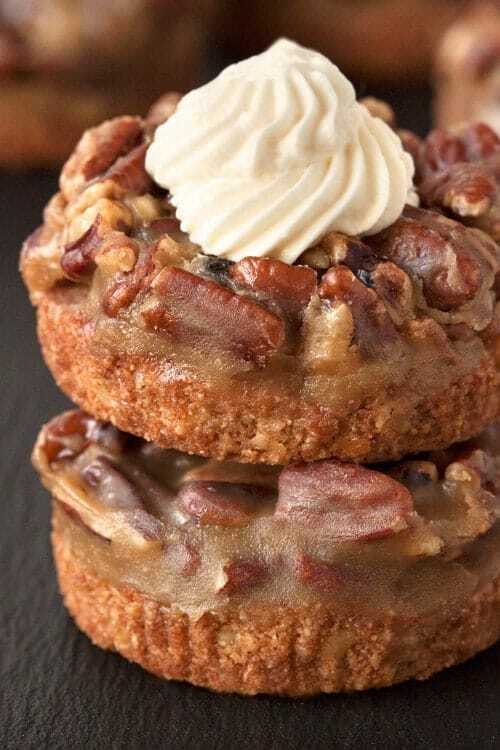 Don't skimp on the cooling time or the caramel may leak through. 4. Place the chopped pecans on a baking sheet and roast for 4-6 minutes or until starting to smell toasty. They burn quickly so keep a close eye on them. Remove from the oven. 5. Prepare the caramel. Heat the sugar, cream, butter, vanilla and salt in a heavy bottom saucepan (do not use non-stick) over medium heat. 6. Stir until combined and then simmer for 8 minutes. Do not stir. If needed, tilt the pan to redistribute the mixture. 7. Remove from the heat. The caramel will be quite thin at this point. Let it cool for 20 minutes or until considerably thickened and just barely pourable. Stir in the nuts and then spoon about 2 tablespoons of caramel pecan mixture onto the top of each baked crust. 8. Place the pans in the refrigerator for 2-3 hours or until the caramel has firmed up. Serve cold or at room temperature. These can be left at room temperature for 8 hours. Refrigerate in an airtight container for up to 4 days. *There isn't a direct substitute for coconut flour. If you don't have it on hand, I recommend trying a different crust recipe. Caramel adapted from Chocolate Nut and Caramel Shortbread Tart.